You can use this PCA-1214M2ESC Portable Winch Double Braided Polyester Rope with a range of Portable Winch models for lifting operations. 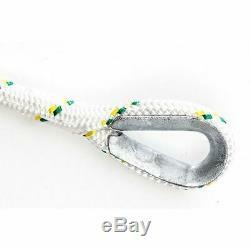 This rope includes an eye splice and thimble and. Is made with double braided polyester material for durability and low stretch properties, maximizing safety. It is also abrasion resistant, making it an excellent choice to use with the Portable Winch when it is subject to heat and friction. Ropes with an eye splice and thimble are mandatory for lifting operations with the PCT1800, PCH1000, or PCH2000 Portable Winch models. The only diameter rope to be used for lifting is 1/2. 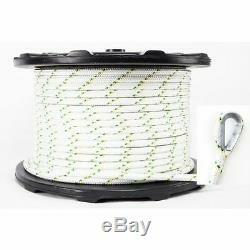 Portable Winch PCA-1214M2ESC Double Braided Polyester Rope. Length: 492' x Diameter: 1/2. Stretches only 12% at break point. One eye splice and thimble included. The item "Portable Winch Double Braided Polyester Rope 492' x 1/2 PCA-1214M2ESC" is in sale since Thursday, January 19, 2017. This item is in the category "Business & Industrial\Material Handling\Hoists, Winches & Rigging\Winches\Electric Winches". The seller is "mkrittenhouse" and is located in Niagara Falls, New York. This item can be shipped to United States, United Kingdom, Denmark, Romania, Slovakia, Bulgaria, Czech republic, Finland, Hungary, Latvia, Lithuania, Malta, Estonia, Australia, Greece, Portugal, Cyprus, Slovenia, Japan, China, Sweden, South Korea, Indonesia, Taiwan, South africa, Thailand, Belgium, France, Hong Kong, Ireland, Netherlands, Poland, Spain, Italy, Germany, Austria, Bahamas, Israel, Mexico, New Zealand, Singapore, Switzerland, Norway, Saudi arabia, Ukraine, United arab emirates, Qatar, Kuwait, Bahrain, Croatia, Malaysia, Brazil, Chile, Colombia, Costa rica, Panama, Trinidad and tobago, Guatemala, Honduras, Jamaica, Barbados, Bangladesh, Bermuda, Brunei darussalam, Bolivia, Ecuador, Egypt, French guiana, Guernsey, Gibraltar, Guadeloupe, Iceland, Jersey, Jordan, Cambodia, Cayman islands, Liechtenstein, Sri lanka, Luxembourg, Monaco, Macao, Martinique, Maldives, Nicaragua, Oman, Peru, Pakistan, Paraguay, Reunion, Viet nam, Uruguay.